Algae grows in various forms. Filamentous algae is most common. It grows in strings or mats – often on the surface. Planktonic algae causes green water. It consists of millions of individual cells that cloud together. Chara is a weed-like form of algae. It grows like a carpet along the bottom of the pond. It has a musky odor and feels gritty. Use Cutrine liquid on filamentous and planktonic and Cutrine granular on chara. Emergent plants grow around the perimeter of a pond in shallow water with all or most of their foliage above water. Cattails, Bulrush, Reeds, Purple Loose Strife, Pennywart, and Pickeralwood are common emergents. Use Shore Clear for best control. 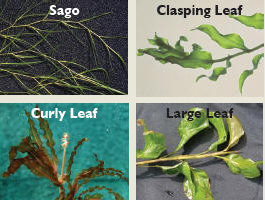 The pondweed family has over a dozen varieties. Each of these plants can grow in deeper water – up to 10′ deep in clear water. Sonar, Aquathol Super K, and Hydrothol work well to control growth. This plant grows in thick clumps and is usually not a big problem. The leaves are in whorls of three around the stem. It also grows in deeper water like pondweeds. Komeen or Reward are most commonly used to combat Elodea. Duckweed is hard to control. 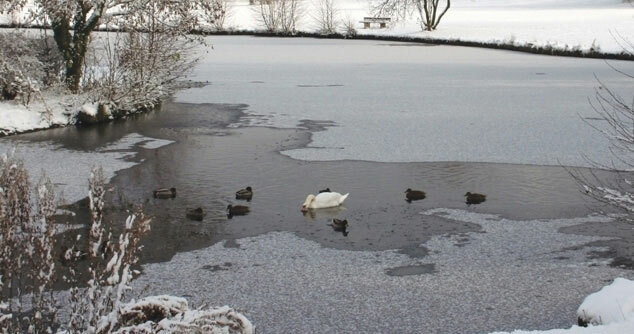 It forms a thin layer over the surface in calm, wind-free ponds. Duckweed will not grow well in moving water, so use of a surface aerator will help in controlling growth. For chemical treatment, Sonar is the best choice. Often, only one Sonar treatment will last for multiple seasons. Reward or Weedtrine mixed with Cutrine and a surfactant can also be used, but regrowth can occur quickly if application is not done properly. While beautiful to look at, waterlilies can become a problem in many ponds. They grow off of a large central root system. Some growth is great for shade and cover for fish, but when left unchecked, they will over populate. Use Navigate to control unwanted growth. Shore Clear/Aquastar with surfactant will also work if used after blossoms appear. A very prolific plant that spreads easily since fragments of plant can reroot and grow. Do not try to remove by raking. Grows very dense, making swimming and boating difficult. Sonar or Navigate are best for treatment options. Naiad, Coontail, Bladderwort, Hydrilla, Parrot Feather, Water Hyacinth.